"I and the Bird" carnival deadline: today! Bird bloggers! Have you sent a submission to Thomas for this week's I and the Bird? Today's the deadline for your chance to share your most recent and masterful post with birders around the world. Make Thomas' job as the carnival host as easy as possible, and send an e-mail with a detailed description of the post and its hyperlink now. If your blog has appeared in previous versions of I and the Bird, have you given back by serving as the host? It seems only fair, and if you sign up to host an upcoming edition, then you're ensuring that other bird bloggers can enjoy the worldwide exposure, just as you did. Please contact Mike about hosting an edition. Did you miss the previous I and the Bird? Here it is, compiled at Twin Cities Naturalist by Kirk Mona. Some of us enjoy hosting the carnival so much that we do it more than once! WildBird has hosted two editions, #17 on Feb. 16, 2006, and #65 on Dec. 27, 2007. Other blogs have hosted the carnival three or more times! For a complete index with hours of guaranteed pleasurable reading, click here. Looking forward to Thursday's edition! Almost 150 seabirds -- including grebes, murres, loons and scoters -- began receiving help from International Bird Rescue Research Center this weekend after being covered with an "unusual sea slime." The birds traveled by van from Portland, Ore., to San Francisco Bay Oiled Wildlife Care and Education Center in Cordelia, Calif. In this case, a particular species of phytoplankton, typically seen off the coast of California, was found in the northern waters in extraordinarily high numbers, potentially linked to warmer-than-usual water temperature. Stormy weather churned the phytoplankton bloom into a soaplike foam. For aquatic birds, this can be deadly. It is the structure of a feather and their alignment that insulates a bird from water and wind – like shingles on a roof. 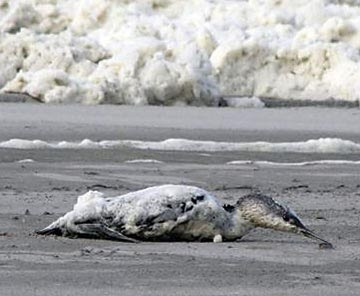 When something disrupts this, whether it is oil, dirt, or a surfactant such as this, the bird is exposed to the elements and will quickly become saturated and cold. If they do not get to land, they will drown, as many may have. Kingfishers -- those aquatic birds that favor rivers, streams and ponds -- get the royal treatment in the November issue of National Geographic Society's magazine. The great folks at the society ensured that birders gets to savor the birds in detail via the article by Hannah Holmes and the photo gallery of dazzling six images by Charlie Hamilton James. You'll relish the incredible images, some shot underwater and others revealing details of the bird's life that most birders never will see. I especially like the gallery's second shot, where the kingfisher appears as a blue streak. The caption says the birds can dive faster than 25 miles per hour. Very cool. Veolia Environnement Wildlife Photographer of the Year Competition 2009 revealed its winners in London yesterday, and three American photographers earned honors in the 46th annual contest. This year's competition drew more than 43,000 entries. Rob Palmer from Colorado won the Behaviour: Birds category with an image of a juvenile Bald Eagle chasing a Red-winged Blackbird. In January 2009, something strange happened at a cattle feedlot in Colorado. Rob noticed a group of bald eagles sittings in a large tree nearby. Usually, bald eagles hunt near water and eat fish, but they are also opportunists. These ones had gathered to feed on starlings and red-winged blackbirds and would launch themselves out of the trees and chase the small birds up into the sky. 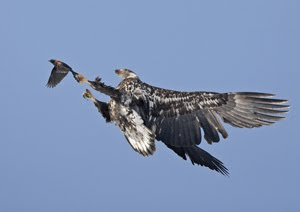 In this case, the eagle (a juvenile) was successful, but often the small birds would out-fly their attackers. Strangely, some of the birds would suddenly fly up in an erratic way, making themselves easy targets for their prey. Rob suspects that the cattle feed may have been treated with an avicide (bird poison) that affected the birds’ nervous systems. After two weeks, the odd behaviour of the small birds stopped and within days, the bald eagles left. Thomas Haney from Texas won the One Earth Award, while Kevin Schafer from Washington earned top honors in the Behaviour: Mammals category. The images will appear at London's Natural History Museum until April 2010 in an exhibition that showcases all winning photos plus runners-up and commended images. The competition is organized by London’s Natural History Museum and BBC Wildlife Magazine. 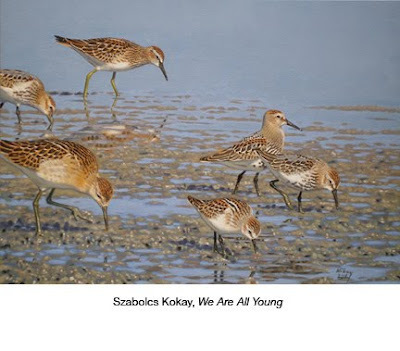 Via eBay, American Bird Conservancy is accepting bids on original artwork by Paul J. Greenfield. With Robert S. Ridgely, Greenfield created "The Birds of Ecuador" and now provides 11 bird paintings to raise funds for ABC. The unframed acrylic paintings measure approximately 22 inches by 14 inches, and the starting bids range from $5,000 to $8,500. Close to 100% of the final sale price will go to ABC. Each painting will arrive with a certificate of authenticity. Bidding will end on Oct. 23. 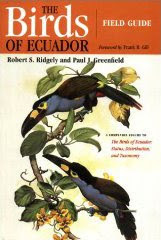 Paul J. Greenfield has studied and painted birds in Ecuador for over 35 years. He undertook the initial work for these paintings at his studio in Ecuador, and completed the pieces at the Academy of Natural Sciences in Philadelphia. Paul is closely involved in the conservation of the birds he paints, and sits on the Board of Directors of the Jocotoco Foundation, ABC's Ecuadorian partner group, alongside the book's co-author Robert Ridgely. "A monumental work that sets a new standard for South American bird guides, The Birds of Ecuador fills a huge information vacuum. These volumes are a fitting tribute to the authors' passion and commitment to pass on their unparalleled knowledge of one of the world's richest avifaunas. Ecuador's nearly 1,600 bird species are here made accessible in a user-friendly format." --Steve N.G. Howell, author of "A Guide to the Birds of Mexico and Northern Central America"
Can this bird habitat really offset carbon emissions? For the past few years, people have planted trees in the effort to stop global warming. But now some scientists think they've found another solution: restoring wetlands. 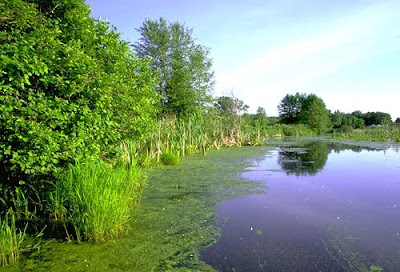 These marshy areas absorb carbon dioxide, the principal heat-trapping gas blamed for warming the planet. Their storage capacity may be greater per acre than forests, scientists said. That little-known function of wetlands could lead to a major role in federal efforts to combat climate change and an environmental boon for the Texas coast. Climate change legislation that has passed the U.S. House and is similar to measures under consideration in the Senate would allow industries to use offsets worth up to 2 billion tons of carbon dioxide a year. Do you agree with the article's comments that the legislation amounts to a hoax or scam? Researchers recently found that Harpy Eagles -- big birds that weigh up to 20 pounds and range from southeastern Mexico to northern Argentina -- have sufficient genetic diversity to bolster efforts to prevent extinction. Tests on 66 of the predatory birds in 12 countries revealed "high levels of mitochondrial genetic diversity," according to a press release from The Peregrine Fund. Scientists from the Boise, Idaho-based Peregrine Fund and the University of Michigan led the study, the first to look at mitochondrial DNA in this study. TPF began a Harpy Eagle recovery program two decades ago, raising captive-bred eagles that were released into the wild and remain under scrutiny for reproductive and survival rates. The peer-reviewed study recently appeared in Public Library of Science and is available online. A concise fact sheet about Harpy Eagle appears here. 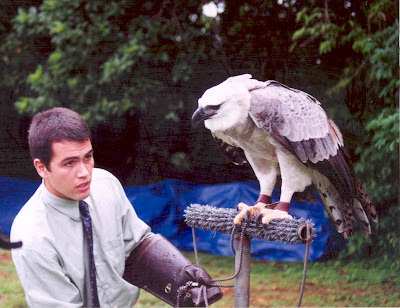 Above, Peregrine Fund biologist Angel Muera works with a captive Harpy Eagle. Look at the size of that bird! Cornell Lab of Ornithology's Celebrate Urban Birds project invites you to participate in its contest this month. 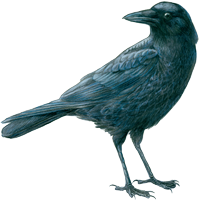 "A Murder of Crows and Other Spooky Bird Tales" accepts entries until Oct. 31, and entries can be photos, stories and videos sent via e-mail. Birds can be downright spooky sometimes. A European Starling flies at your head, thousands of crows roost in a downtown park, a pigeon takes over your balcony. With Halloween just a few weeks away, we want to see and hear spooky things about birds! We'll try to explain what's really going on with their puzzling behavior. Go outside and take a photo, do a painting, write a story or a poem, or even shoot a video showing crows, pigeons, starlings, an owl, or any kind of bird doing something strange. You can download a flyer to encourage more participation. You'll find more details -- such as the terms of agreement and the many prizes including optics, books and CDs -- here. Remember to send your entries via e-mail by Oct. 31. Good luck! Not too late to join Project FeederWatch! Want to share your backyard birds with a nationwide project? Then Cornell Lab of Ornithology wants to hear from you! 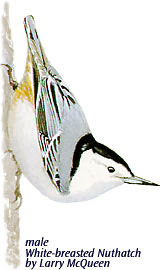 Project FeederWatch runs from November through April, and during those months, backyard birders count and report the birds visiting their feeders. The citizen science project provides training and materials, so new birders can join the fun, too. Many details appear here, including the $15 participation fee that covers the research kit provided via snail mail or online. Register today so you can receive the kit as quickly as possible! "Birds in Art" exhibit: coming to a museum near you? Did you see the article, "Birds of a Feather, Together" last week in The Wall Street Journal about Leigh Yawkey Woodson Art Museum's "Birds in Art" event? The nine-week annual program celebrates numerous bird species in various mediums. 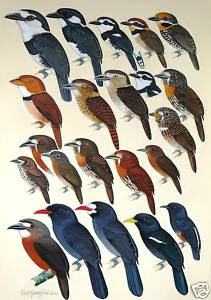 The range of species would set John James Audubon's heart aflutter. There are tiny graceful hummingbirds, barn and burrowing owls, white peacocks, secretary birds, wild turkeys, scarlet and military macaws, flamingos and egrets, and one plug-ugly California condor that almost steals the show. (I didn't count them all, but this year's exhibition also saw a rash of roseate spoonbills.) The artists, whose works were chosen by a jury of three from about 630 entrants and 1,000 works, are a similarly diverse flock from all over the U.S. and such far-flung countries as Japan, Australia and Sweden. The 11-image WSJ slideshow begins with "Crane Gathering" by John Busby. A slideshow from a reception at the museum celebrates the artists and other attendees (although I didn't see captions identifying the individuals in the photos). The 100-piece exhibit will remain in Wausau, Wis., until Nov. 15. Then a 60-piece selection will travel until January 2011 to Muskegon, Mich.; Idabel, Okla.; Tucson, Ariz.; and Los Olivos, Calif.
Are you one of WildBird's Facebook fans? Have you joined us on Facebook as a WildBird fan? If so, you already know that we like to chat about birding and the magazine. We ask for fans' input for the magazine's content; we create photo albums of our readers' bird photos (Wandering Eye), our readers (On The Fly) and our sponsored teams (Great Texas Birding Classic, shown) -- and we give away bird books! WildBird asks that you provide the common name of the "marsh poodle" if you want to receive "Shorebirds of North America, Europe, and Asia: A Photographic Guide" by Richard Chandler http://bit.ly/1MsZOn The first correct answer garners a copy! So, which book will be up for grabs next? Will you see the update before anyone else? Good luck! Above: The TAMUG WildBirders -- cosponsored by Texas A&M University Galveston and WildBird -- competed in the one-day contest of the 2009 Great Texas Birding Classic, birded Anahuac National Wildlife Refuge (shown) and other sites, and won the Upper Coast division. Go team! On The Fly: Where do you read WildBird? We want to see where you read WildBird when not at home! Send a 300dpi JPG with a detailed caption to wildbird@bowtieinc.com with the subject line "On The Fly." We've received some creative images from unexpected locations, and we look forward to seeing more! Double-check that the file's resolution is 300dpi, not 72dpi. The file's print size needs to be 4x5 inches or larger. Also remember to provide your full name and the city and state in which you live. --> Please adhere to the requested method of delivery: e-mail. If you try to submit a photo via Snapfish, YouSendIt, CD or some means other than e-mail, you're operating outside our streamlined system, and you risk disqualification. If your photo appears in a future issue of the magazine, it might join the On The Fly photo album on WildBird's Facebook page, too. 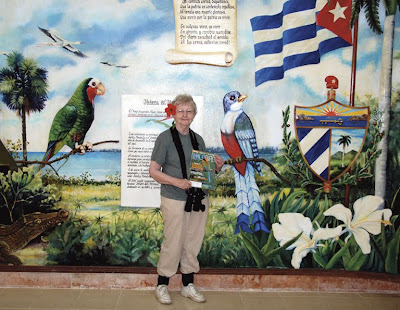 Above: Judith O'Neale of Lafayette, La., went to Cuba with Caribbean Conservation Trust to survey birds at national parks and biosphere reserves -- and took this photo with the March/April 2009 issue.